Had to make a post concerning something that we did two weeks ago today. Our family was enjoying a wonderful week in the Wisconsin Northwoods at a place that has become a family tradition for 45 years. We are returning to the same place the week after Labor Day to celebrate the wedding of our niece Jessica to a great guy, Brett. Jessica enjoys traditional things but is a very modern young woman. So instead of the "traditional bridal shower" we celebrated by having a "tea". 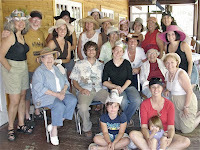 The photo is of the "Ladies of Nawakwa" decked out in our hats for this celebration with Jessica. It was a fun time. The decor for the tea was rustic and simple and very unique! It's amazing what you can do with sand, rocks, leaves, wild flowers, ferns, birch bark and lake water.